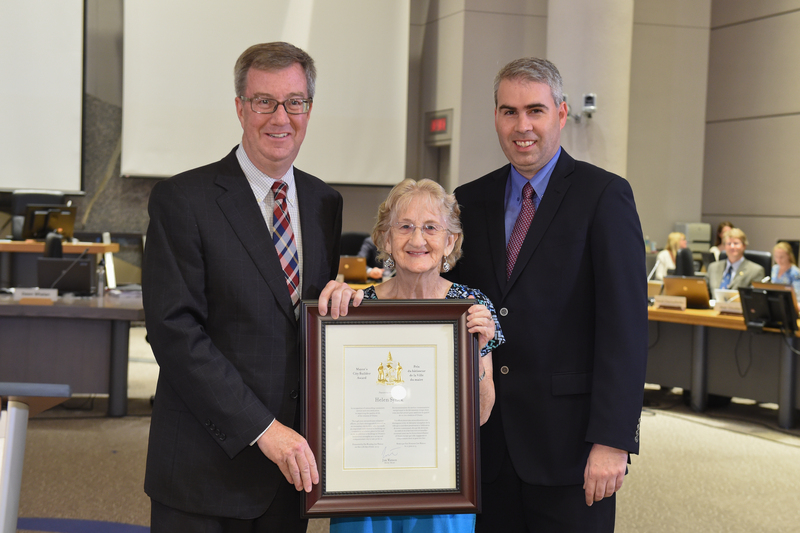 Mayor Jim Watson and River Ward Councillor Riley Brockington presented the Mayor’s City Builder Award today to Helen Synek, recognizing her 30 years of volunteer work at the Caldwell Family Centre in Carlington. In 1954, Helen left school in Youghal, Ireland, at 14 to start helping to support her family by working in a textile factory. She immigrated to Ottawa when she was 20. She has never forgotten her blue-collar roots and the loneliness of moving to a much bigger city so far from home. Her upbringing, and the challenges of living in a new country, helped her to make friends easily and to be empathetic to the people who seek essential social services as well as companionship at the Caldwell Family Centre. She continues to work in the day program at the centre most of the day, but also helps with the neighbourhood food bank and the seniors’ drop-in program. At almost 75 she has no plans to retire, preferring to stay busy and active helping the hundreds of people who come to the centre, whom she embraces as friends.